Beth Grant is my friend, my mentor and also my client. As the first person to use and license the Joy|Money Matrix for use in her own thriving business, she's given me invaluable feedback about the mental model and the process to facilitate transformation and clarity for those who use it. Business: Truth and Consciousness. Her body of work includes products and services for entrepreneurs. 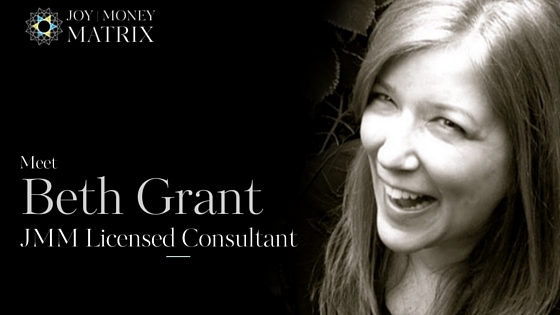 She created a phenomenal framework called the Archetype Alignment Grid that helps her clients align their marketing and businesses using her unique grid. Fun facts: Beth writes songs and sings. How she uses the JMM in her business: Beth uses the JMM for her own planning (marketing, products and services) and she leads individuals and small groups through the Joy|Money Matrix process all over the world. It's with great pride (and humility) that I share her thoughts about the Matrix and how it has impacted her own business and those of her clients. "The first time I created my Joy|Money Matrix I could not believe my eyes. It's like my business was communicating with me through this visual process all the things I wasn't seeing day to day. And not just my business, but my soul. Each JMM has a different story to tell; in fact, each quadrant has a story longing to be told. I immediately saw new marketing choices to make, and a big change I needed to make in my business model that was essential to my well being. It also saw how much I was neglecting my creative pursuits and I knew this had to change. Then, I asked Lauren if I could use it with my clients at our retreat. They LOVED the process I walked them through. Some saw literally hundreds of thousands of dollars of potential revenue just sitting there; others saw their choices validated; another saw a nifty way to integrate her art into her coaching business. I asked them to rate it ... every participate gave the JMM work a 10 out of 10! I use the JMM all the time now ... every project is planned using it. Every marketing decision is gauged by where it falls on my JMM. I use sections of it with my clients to help them make decisions in their business model and their marketing ... in everything. The real power in this tool is in its simplicity. It's quick, easy and you can do it on the fly ... all you need is a cocktail napkin and a pen and you're poised to make whopping big decisions in a way that honors what you truly want." If you would like to work with Beth on your own Joy|Money Matrix, then you can learn more and reach out to her here. If you'd like to be notified when the DIY Joy|Money Matrix launches, just put your details below. Older PostWhat is a mental model and why are they important?